A Bus turnout is a short length of roadway that has been widened to allow for buses to reach a bus stop without blocking the curb side travel lane. Because bus turnouts use additional right-of-way and make it more difficult for buses to re-enter traffic, bus turnouts should only be used in limited circumstances. The farside of an intersection is the preferred location for turnouts. Nearside turnouts typically should be avoided because of conflicts with right turning vehicles, delays to transit service as buses attempt to re-enter the travel lane, and obstruction of sight clearances at intersections. The exception is where buses use a right-turn lane at an intersection (where a farside pullout is not possible). Turnouts in mid-block locations are not desirable unless associated with a major transit-oriented activity center and subject to the general guidelines above. Example of a bus turnout. Turnout should be placed at signalized intersections where the signal can create gaps in traffic allowing the bus to re-enter the street. On streets with bike lanes and where bus layovers occur, the turnout should be wide enough so that buses do not impede the bike lane. Where the outside travel lane is wide, a partial turnout width may be used. The minimum combined width of the outside travel lane plus turnout width must be at least 24’6”, to allow traffic to pass the bus. Bus bulbouts, also known as nubs or curb extensions, solve the problem of locating bus patron amenities in dense urban environments with considerable pedestrian traffic. A nub is essentially a sidewalk extension through the parking lane that becomes directly adjacent to the travel lane. When used as a bus stop, a bus will stop in the traffic lane instead of weaving into the parking lane; therefore, they operate similarly to curb-side bus stops. 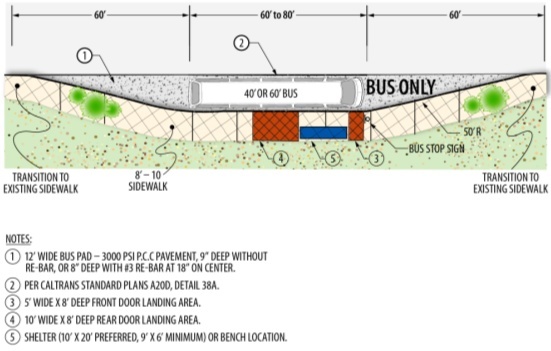 Moreover, when space limitations prevent the inclusion of amenities, curb extensions create additional space at a bus stop for shelters, benches, and other transit patron improvements along sidewalks. Curb extensions also provide enough space for bus patrons to comfortably board and alight from the bus away from nearby general pedestrian traffic. Finally, nubs shorten the pedestrian walking distance across a street, which reduces pedestrian exposure to on-street vehicles. Curb extensions should be considered at sites along crowded city sidewalks with high patron volumes, where parking along the curb is permitted. Curb extensions have particular application along streets with lower traffic speeds and/or low traffic volumes where it would be acceptable to stop buses in the travel lane. Collector streets in neighborhoods and designated pedestrian districts are good candidates for this type of bus stop. Curb extensions should be designed to accommodate vehicle turning movements to and from side streets. Major collector and arterial streets should be designed to accommodate larger bus turning radius and therefore would not be good candidates for bus bulbouts. Figures 7-8 and 7-9 shows typical curb extension design. Roadway pavement (or shoulders, if that is where the buses stop) must be of sufficient strength to accommodate repetitive bus axle loads of up to 25,000 pounds. Exact pavement designs will depend on site-specific soil conditions. Areas where buses start, stop, and turn are of particular concern because of the increased loads associated with these activities. Using reinforced concrete pavement pads (see Figures 7-10 and 7-11) in these areas reduces pavement failure problems that are common with asphalt. A minimum 8” thick reinforced concrete pad should be provided, with engineering consideration of the specific soil conditions. The pad should be 12’ wide with a pavement section designed to accept anticipated loadings. 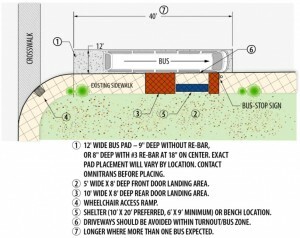 The length of the pad should be based on the anticipated length of the bus that will use the bus stop and the number of buses that will be at the stop simultaneously. The sbX vehicles operate in running ways, which serve as the major determining factor in the speed, reliability, and total cost of a BRT system. Greater separation between the running way and mixed traffic produces faster operating speeds, and greater reliability, but increases capital costs. Mixed-Flow Traffic Lanes: Travel lanes used by sbX vehicles, local buses and regular traffic. Converted Bus-Only Lanes: Lanes, either at the curb or the median, that have been converted from mixed-flow or parking lanes to bus only lanes. These lanes may be used exclusively for buses during peak periods or throughout the day. The lanes are not physically separated from adjacent mixed-flow lanes and are usually delineated by pavement striping or signage. 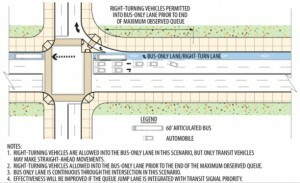 The sbX vehicles and local buses would be allowed to enter curb running converted bus only lanes, however local buses would not be able to use center running lanes with a single platform, due to door configuration of local bus vehicles. Dedicated Bus-Only Lanes: Similar to a converted bus-only lane, either at the curb or the median that are purpose-built for transit and are physically separated from mixed traffic by barriers, bollards, or raised medians and/or curbs. Physical implementation and capital costs are somewhat higher for dedicated bus-only lanes as compared to converted ones. The sbX Green Line E Street corridor operates in portions of center running dedicated bus-only lanes. 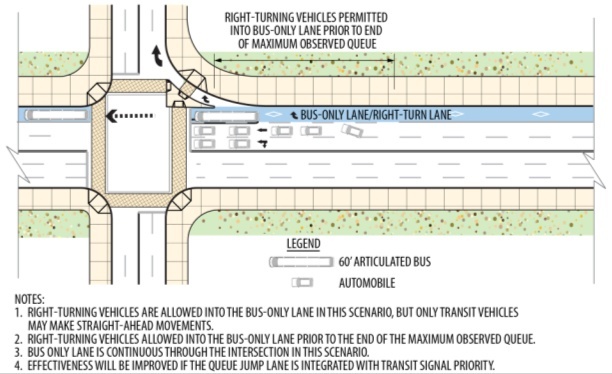 The sbX vehicles and local buses would be allowed to enter curb running dedicated bus only lanes; however, local buses would not be able to use center running lanes with a single platform, due to door configuration of local bus vehicles. In all three types of running way, the local bus stops would be located at separate stop locations from the sbX service. Delay at intersections from queuing vehicles detrimentally impacts bus performance. The cumulative impact of intersection delay can significantly hinder bus on-time performance and operating speed. Queue Jumpers are an effective solution that provides a special lane allowing transit vehicles to bypass queues at congested points, such as intersections. Queue jumpers consist of a nearside right-turn lane and farside bus stop and/or acceleration lane. Buses are allowed to use the right-turn lane to bypass traffic congestion and proceed through the intersection. 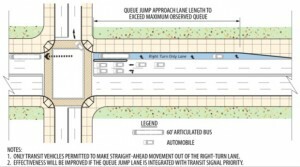 Additional enhancements to queue jumpers could include an exclusive bus only lane upstream from the traffic signal, an extension of the right-turn lane to bypass traffic queued at the intersection, or an advanced green signal indication allowing the bus to pass through the intersection before general traffic does. Advantages in using queue jump lanes include travel time saving, increased transit competitiveness, improved image of transit, and increased corridor carrying capacity. Furthermore, time saving can be achieved if the lane is integrated with a bus-only lane and/or TSP. Capital costs are relatively low compared to large-scale physical measures, such as grade separation, to reduce intersection delay. 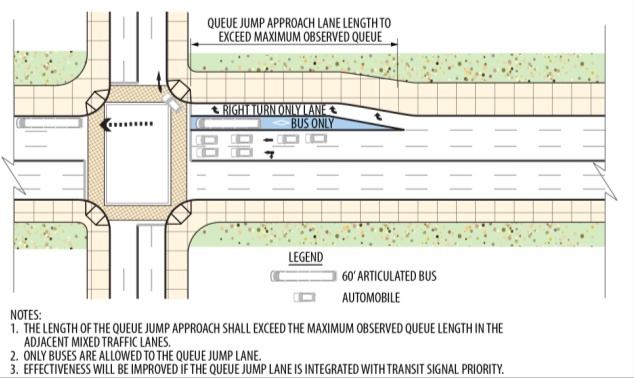 Queue jumpers shall be implemented on a limited, as needed basis, at primary intersections, where delay significantly impacts bus performance, where adequate right-of-way exists to place a queue jump lane, and where benefits to transit are potentially the highest. A public awareness education process may be needed when queue jumpers are being implemented. 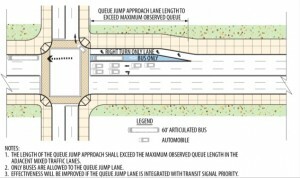 Queue jump lanes provide the greatest benefits to buses when combined with TSP and/or bus-only lanes. 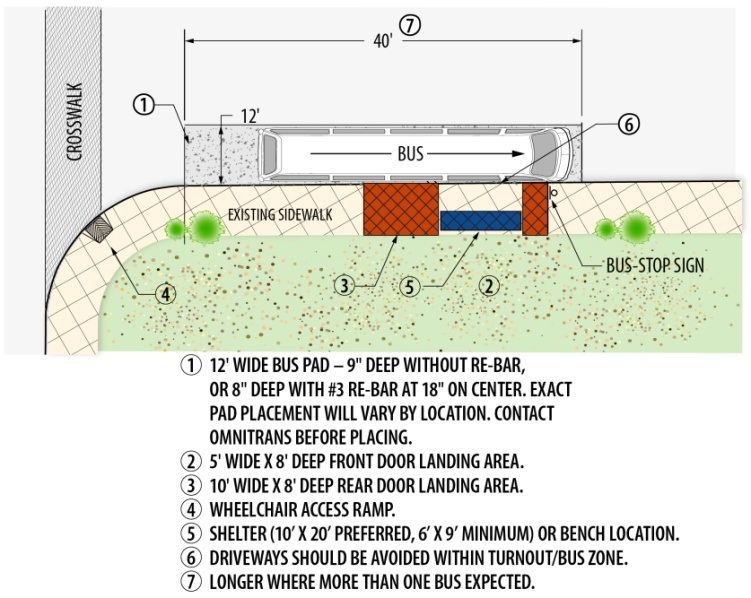 For More Information please see Section 7 and Section 10 of the Transit Design Guidelines.